Adoption FAQ: When is My Adoption Decision Final? Are you facing an unplanned pregnancy and considering adoption for your baby? Adoption is a positive choice that, for many, comes after much thought and consideration. If you are exploring this option or looking to learn more about the process, you may be wondering: When do I need to make a final decision? What is the timeframe for making an adoption plan? Can I ever change my mind? As a private, non-profit adoption agency working with expectant/birth mothers all over the United States, Adoptions With Love wants you to be prepared for the road ahead. In this article, we will help you understand your timeline for making an adoption plan – and a final decision – for your baby. To understand the timeline of an adoption, it is important to first understand the legal considerations involved. During the adoption process, the birth parents – you and the biological father, if known – will need to relinquish their parental rights. A birth mother can only do this after her baby is born. The last legal step is the finalization of adoption in court. Before an adoption can be finalized, some state qualifications must be met. No adoption is final until an adoption surrender is signed. A surrender is a legal document in which the birth parent agrees and consents to the adoption of the child. The laws vary by state on when exactly this can happen, but all states require birth mothers to wait until after birth to finalize their decision and sign legal paperwork. This gives the birth mother time to rest, meet her baby, and think about her decision again before terminating her parental rights. No decisions made before the birth of her baby are binding in any way. Some states allow birth mothers to sign surrender forms for adoption immediately following the baby’s birth. Other states, however, require a certain number of hours or days to pass before the birth mother can sign anything official. In some states, official papers must be signed before a judge. In other states, however, this is not necessary. In Massachusetts, a birth mother must wait four days to sign a consent to the adoption. Once the adoption papers have been signed, if there is a “revocation period” during which you – the birth mother – can change your mind. This is part of your birth mother rights. Should you change your mind, your child would be returned to you. Of course, this varies state to state. Only some states allow you to revoke your consent to the adoption, days after the papers have been signed. Once the adoption consent forms are signed and the revocation period has passed, the birth parent no longer has any rights to the child and cannot change her or his mind. Adoption is a lifelong decision. This is why it is important to speak with an attorney and social worker about the legal procedure in your state, as well as your rights as an expectant/birth mom. Adoptions With Love provides all birth mothers with free access to attorneys who specialize in adoption. To learn about the laws specific to your state now, you can visit the website of the Child Welfare Information Gateway. You may also contact a reputable adoption agency that works nationwide, like Adoptions With Love. Adoptions With Love has close relationships with expert and compassionate adoption attorneys all over the U.S. If you need legal guidance at any point in your journey, we can meet you wherever you are, to discuss your legal rights and your adoption decision. Adoptions With Love wants to be sure that you feel comfortable and confident in your adoption decision. We place no pressure to make an immediate plan. No matter where you live, there is plenty of time to finalize your decision about adoption. You could make your decision from the hospital bed, or you may choose to wait a bit longer. There is no right or wrong here. This is your plan. Adoption is a lifelong choice; however, it does not have to mean saying “goodbye” to your child. Through open adoption, you can keep in touch with your child’s family over the years. Part of the adoption process involves creating an adoption agreement, often called an “open adoption agreement,” that outlines the level of contact a birth parent will have with their child and adoptive family over the years. You can choose to receive emails with photos throughout the years. You and the adoptive family can choose to keep in touch with in-person visits occasionally. Adoptions With Love can serve as a liaison for these updates, or you may choose to work with the family directly. Each birth mother may choose something different. Your open adoption plan may be drawn up in the form of a legal contract long before birth. It can also be tweaked over the years, to accommodate the needs of a growing child. Should you decide that adoption is the best path for you and your child, Adoptions With Love will support you and guide you through this journey. We will offer help without pressure, judgment or bias, and work with you on finalizing your decision, respecting any choice that you make. Contact us to learn more about making an adoption plan by calling us at 800-722-7731 or texting 617-777-0072. 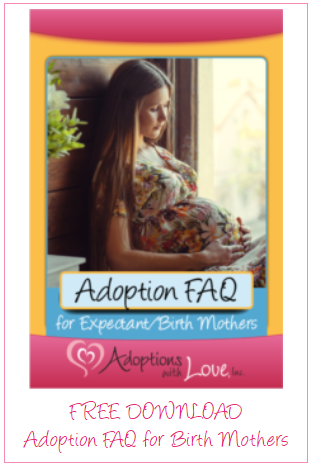 You may also download our free eBook below, “Adoption FAQ for Birth Mothers,” for more information.